British GT GT3 Champion Piers Masarati is in the midst of an intensive build up to the 2006 Championship, in which he will manage Trackspeed’s three car GT Cup effort. 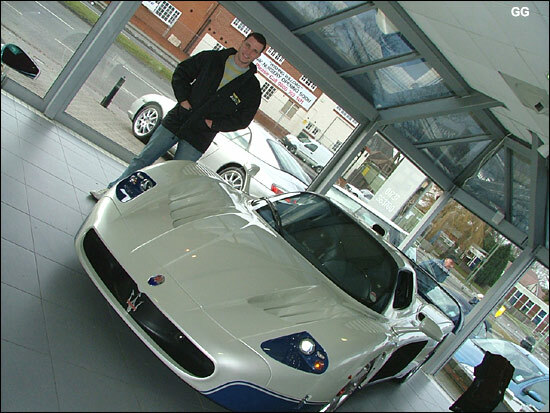 Today though he took time out to take a closer look at his (almost) namesake, one of just 49 road car Maserati MC12s, this one currently on display at the splendid Romans International showroom in Banstead, Surrey - alongside a Ferrari Enzo, Porsche Carrera GT, Mercedes SLR and Aston Martin Vanquish. This car can be yours for just a little under £600,000. There must be a joke somewhere regarding the “Wishing Willows Day Nursery – Opening Soon” - just to the right of Piers' head. Lisa, have you got some news for us? More Maserati MC12 news due – soon, we hope.